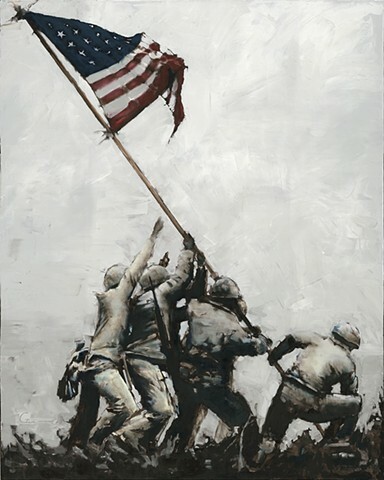 Depicted in the painting are Marines of the 5th Marine Division raising the American flag on Mt. Suribachi, Iwo Jima on February 23, 1945. The image has been iconic for the Marines since the release of the photograph by American photographer Joe Rosenthal. It was an inspiration to the troops and the American public both anxious to see signs of progress in the distant efforts of a Nation at war ‘overseas’. It was the only photograph to win the Pulitzer Prize in the same year of its release. The artistic representation of the image is aligned closely with the composition of the original black and white photograph and in a single view, evokes an appreciation for the strength, determination, and resilience of our Nation.